When you think of superheroes, who comes to mind? Superman, Batman, and Wonder Woman are all obvious answers, but there’s one problem — those heroes are fictional. They don’t exist. Now think realistically. Firefighters, policemen, and soldiers help protect people every day. But wait — don’t insurance Agents do the same thing? Often overlooked, the job of an American Income Life Agent is both honorable and noble. Agents are living, breathing, working class heroes. Kids idolize superheroes for their superpowers, heroic battles, and flashy costumes. Who says Agents don’t have the same qualities, but on a realistic level? American Income Life Agents have the power to sell life insurance and supplemental health insurance, both of which help provide protection to policyholders and their loved ones. They have the power of persuasion — to use their stellar presentation skills to convince prospects of the importance of life insurance. They also have the power to help. American Income Life Insurance Agents are there for customers during the darkest days of their lives, helping them pick up the pieces and deal with adversity. Agents wage heroic battles against the evil What If Monster by offering customers protection against the “what if’s” in life. What if you died unexpectedly? What if you were diagnosed with cancer? What if you suffered a stroke? What if you died in an accident – would your loved ones be able to grieve, or would they struggle to financially stay afloat? Consider each one of these “what if’s” a demon that you can help American Income Life policyholders combat. I know you’re wondering about the flashy costumes, right? 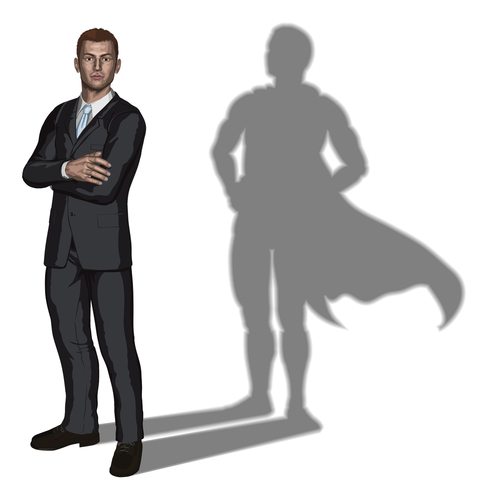 Just because capes aren’t appropriate in a business professional environment doesn’t mean you’re not a hero. Now don your invisible superhero cloak, get out there, and start helping people!